Latest News Information. Learn about allergies and intolerances and keep up to date with everything new! If you’re sniffling, itching, coughing, or feeling extra tired lately, you may be among the millions of people who suffer from allergies each year. Since many allergy-related issues can point to other ailments, it can be difficult to identify the cause of your symptoms, especially if you don’t know what to look for. Check out these signs from The Insider that you may have an allergy and not even know it. For more information on allergy testing, order your allergy test here. Allergies are everywhere in the news, with even Kim Kardashian wading in on allergy testing and the news. Her son experienced an allergic reaction but she was quick to react. If you would like to know how you should react or what you can do to help protect yourself and your family against allergies then you should check out our website. The Hartford Yard Goats have eliminated peanuts and peanut products, including Cracker Jack, from Dunkin’ Donuts Park, with the hope that fans allergic to the nuts would be able to attend ballgames. With allergies on the rise, allergy testing has never been so important, so if you feel like allergy testing is what you need, check it out here. Here are the top 10 US cities struggling with Spring allergies. If you recognize any of these news articles then allergy testing could be exactly what you need. With Spring arriving, the trees will soon be blossoming, and the spring flowers will start to fall and spread beauty amongst the state parks. There will also be green, green grass which will make everything look more pleasant… Unless you have an allergy! Check out allergy testing now! 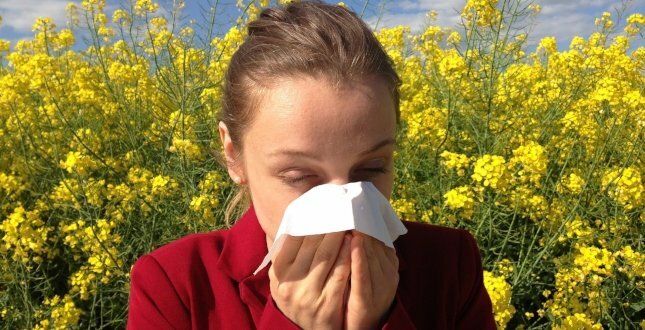 You might feel like suffering from allergies is going to happen every spring no matter what, but there are ways to help alleviate your symptoms. Check out these 8 fantastic tips compiled by the American College of Allergy, Asthma and Immunology. We promise they’ll help you enjoy the season instead of sitting it out indoors. If you think allergy testing may be exactly what you need, then you can order a test here. Could airlines do more about pet allergies? The skies can be hostile if you’re one of the millions of airline passengers who suffer animal-related allergies. Add food allergies, and it becomes a transportation jungle. That’s partly because airlines must consider competing needs: the passenger who needs a service animal versus the flier for whom animal dander is an issue, and the passenger who has a food allergy versus fliers who do not. Is this something you’ve experienced? Do you suffer from one or the other and avoid flying? See more of the article from the LA Times here. It’s so hard when your close friends can’t hang out at your house because your best friend, the cat, lives there…  If you do decide to have allergic buds over, there are a few ways you can help mitigate their potential allergic reactions a bit! Check out this article from Lifehacker… It might just change everything! Hopefully, we will continue to see state-of-the-art developments in the process of pet allergy testing!